By JCNA member Morril "Bud" Marston this story of post WWII Jaguar Key Fobs is complete! Although largely forgotten for more than half a century this story wrapped in an impenetrable mist and now exposed by a dedicated researcher and Jaguar enthusiast. 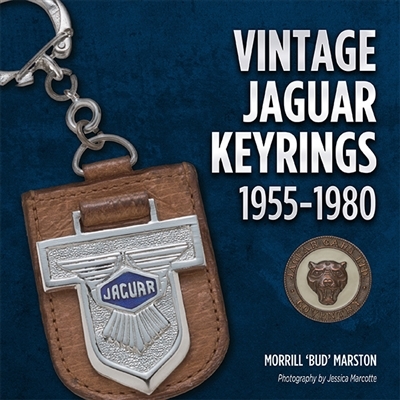 Bud Marston's book reveals the story of Jaguar heritage of more than three hundred splendid motoring talismans form Jaguar's storied past. During the period in question Jaguar produced more than 350,000 cars yet it is possible that fewer than 1000 of these beautiful hand crafted fobs survive. Certainly no living individual has seen more than a fraction of them. Bud Marston was determined to assemble a collection of these fobs and now shares his careful research with the public. 288 pages hard cover with illustrated dust cover and many full color photographs.